Info "Why did the bunny cross the river?" 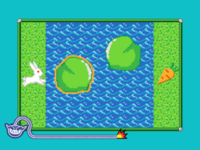 Rabbit River is a microgame from Kat and Ana's stage, featured in WarioWare: D.I.Y. Showcase. There is a rabbit on a bank, and a carrot on the other side of a river. The objective of the game is to tap the water lilies that float on the water and then tap the carrot. By doing so, the game is won. This page was last edited on October 8, 2018, at 22:22.